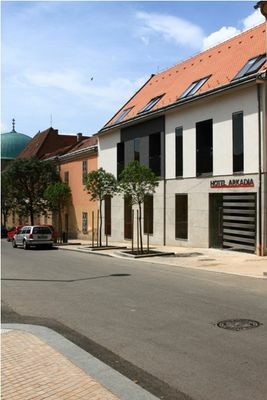 The locatian of Hotel Arkadia is unique. Situated literally in the heart of the historical downtown, it is right at the main square – Széchenyi square – surrounded by the museums and art relics. The interior of the hotel represents the pure lines and colours of Bauhaus style. The use of natural materials accomponied with functionality gives an impressive design to the foyer. Although there are only two floors, an elevator makes easier to get around. Comfortable and cozy rooms satify all needs. Both wireless and cablenet internet is provided all over the hotel. We have a meeting room for 10 people equipped with projector and projection screen). Unwind in the stylish and spacius 18-32 sq m rooms offering comfortable way of relaxing and gives you a perfect retreat after a long day of sightseeing in the European capital of culture. The walls of the rooms and community areas are decorated with the replica paintings and drawings of Pécs originated Bauhaus artists and Jenő Gábor. 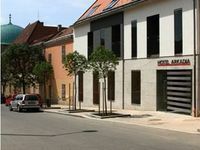 The originals can be visited at the Janus Pannonius Museum of Modern Art.